There was little respite from the blistering heat for tourists visiting the Queen of Hills as it recorded the second hottest day in June over the past one decade. The mercury soared to 31.3°C today. It was on June 10, 1995 that the maximum temperature had touched 31.4°C here. Criticising Chief Minister Virbhadra Singh for ordering such a large-scale administrative reshuffle, the BJP today said this only indicated that he held the administration responsible for the party’s Hamirpur defeat. The spokesperson of the state BJP Randhir Sharma today said the Chief Minister had transferred the deputy commissioners of all four districts of Una, Bilaspur, Hamirpur and Kangra, which formed a part of Hamirpur constituency. The government has revoked the suspension of controversial police officer B.S. Thind and posted him as additional director-general (home guard). The decision was taken by the state government late last evening after the Police Board Review Committee recommended to the Home Department that the suspension of Thind could be revoked. The recovery of an antique coin made in 1818 from the possession of one of the seven persons arrested by the local police on Thursday at Kandwal barrier under suspicious circumstances, took a new turn today when one of the arrested person Durga Dass, a property dealer, from Jammu stated before the police that he had allegedly been cheated by a gang of cheaters who had sold the coin to him for Rs 30 lakh at Palampur. An awards ceremony marked the second day of the convention on ‘Corporate Response to Climate Change’ here today. The state government has approved a B. Ed. college here which would start functioning within a month. The Society for Environmental and Rural Awakening and the Honeybee Network jointly organised a contest for schoolchildren in Kangra district to inculcate in them ecological knowledge and encourage them to learn traditional uses of local plants. The parents of Captain Surab Kalia, who died fighting for the country in the Kargil War, had earlier demanded that those Pakistan army officers who had tortured and brutally murdered their son and five others, violating the Geneva Convention must be punished, have got an overwhelming support from all over the country and abroad. The police has claimed to have solved the murder of 13-year-old Salim Muhaamed who was brutally murdered in his sleep at his home at Har Raipur near Baddi on the intervening night of June 5 and 6. India Travel Mart (ITM) is organising a two-day exhibition here to attract tourists to visit Malaysia and Dubai. A leopard cub was spotted by residents of Sayaral village near Sundernagar this morning, it was not in a position to walk and it subsequently died. It was just a few days old. A team of Forest officals took the dead cub in their possession and disposed it as per the provisions of the Wild Life Protection Act. IPH Dept flouting govt decision? The Irrigation and Public Health (IPH) Department seems to be challenging the authority of the state government by enforcing orders regarding the installation of water meters in all residential premises in the district. A Bihari labourer, Chandan Kumar, was killed after being hit by a speeding truck near Gullerwala village today. There was little respite from the blistering heat for tourists visiting the Queen of Hills as it recorded the second hottest day in June over the past one decade. The mercury soared to 31.3°C today. It was on June 10, 1995 that the maximum temperature had touched 31.4°C here. According to the local meteorological office, the maximum temperature today was almost 7°C above normal. It is not just the day temperature that is soaring, the minimum or the night temperature has also been unusually high. The minimum temperature today was 21.5°C, around 5°C above normal. The meteorological office said the dry hot weather conditions were likely to continue for some more time and more rise in temperature was likely over the next few days. The past record of the hottest summers is likely to be broken as the temperature is on the rise continuously. The general feeling is that respite from the heat wave will only be possible after the arrival of the monsoon, which is likely to hit the state by June 20. The continuing heat wave is also likely to affect the water supply position as the water level in the sources has shown a decline, especially in lower parts of the state. DHARAMSALA: The maximum and minimum temperatures continue to rise in the state. Sundernagar in Mandi district recorded the highest temperature of 42.1°C, showing an increase of 2.1°C from the yesterday’s temperature, while the temperature went up at Dharamsala in Kangra district from yesterday’s 34.9°C to 35.8°C. The maximum temperature at Una came down to 42°C from the yesterday’s high of 43°C. The maximum temperature at Bhuntar soared to a high of 38.6°C as against 37.2°C recorded yesterday, while Hamirpur town was hot at 42°C. Kalpa in Kinnaur district recorded a maximum temperature of 25.1°C. The minimum temperature here was 10°C, which was around 5°C more than the normal temperature. The minimum temperature recorded at Sundernagar was 20.4°C, while at Bhuntar it was 16.7°C. Criticising Chief Minister Virbhadra Singh for ordering such a large-scale administrative reshuffle, the BJP today said this only indicated that he held the administration responsible for the party’s Hamirpur defeat. The spokesperson of the state BJP Randhir Sharma today said the Chief Minister had transferred the deputy commissioners of all four districts of Una, Bilaspur, Hamirpur and Kangra, which formed a part of Hamirpur constituency. “The Congress defeat is a result of the anti-people policies and issues like price rise, unemployment and corruption,” he remarked. Sharma said the Congress would not regain the lost ground by transferring administrative officers as it had ignored the uniform and balanced development of the state. “The Chief Minister has transferred on such a massive scale only to cover up his own failures and shortcomings,” he said. The BJP leader said by ordering all these transfers, the Chief Minister has in a way admitted that his own office had become a den of corruption. The review committee which met here under the chairmanship of chief secretary S.S. Parmar made this recommendation to the Home Department, which finally revoked his suspension. It was last year that the CBI had arrested Thind when his involvement in certain cases in Punjab had come to light. He was charged of raising loans from various banks against the same property. Following this the state government had ordered his suspension. For some time now, Thind had been seeking revocation of his suspension on various grounds. His arrest by the CBI last year had led to a lot of upheaval as he was considered very close to the political bosses. The review committee in its meeting yesterday recommended that since all cases registered against him were outside Himachal, there seemed to be no problem in his reinstatement. It also felt that now since the CBI had already filed the chargesheet against him in the court, there was no question of his influencing the trial after the revocation of his suspension. The BJP however criticised the reinstatement of Thind. Spokesperson of the state BJP Randhir Sharma said Thind’s reinstatement indicated that the Congress had not learnt its lesson even after the Hamirpur defeat. Following his statement, a case under Sections 420 and 120(B) of the IPC has been lodged at the Palampur police station against Praveen, Sanjay from Palampur, Sanjay Verma from Hamirpur, Purn Singh, and Chowdhary Aslam of Jammu and Sameer Sarkar from Delhi. According to the police the complainant Durga Dass of Jammu who was allured by the alleged cheaters said the antique coin that was of Rs 150-crore value in the international market, would be sold to him for Rs 60 lakh only. Accompanied by four accused Purn Singh, Chowdhary Aslam, Lal Hussain and Samir Sarkar, Durga Dass arrived at Palampur three days back and paid Rs 30 lakh to one of the accused Praveen Kumar here. The rest of the settled cost price of the coin had to be paid in Jammu. The complainant had taken Rs 17 lakh as a loan from a bank. The local police produced all seven arrested accused before the sub divisional magistrate this afternoon and handed over Purn Singh, Chowdhary Aslam, Sameer Sarkar and Sanjiv to the Palampur police wanted in the investigations. Thirteen private and public sector companies falling in different categories received the Golden Peacock Awards, 2007, for occupational health and safety. National Thermal Power Corporation Ltd won the award in the power sector, Hindustan Petroleum Corporation Ltd, Mangalore, won it in the refinery section and the Institute of Oil and Gas Production, Mumbai, got the award among oil companies. The other awards went to Ammunition Factory, Khadki, in Pune, 509 Army-Base Workshop Agra Cantonment, HVJ Compressor Station, GAIL, heavy water plant at Tuticorin, Bandra-Worli Sea Link Project, Indalco Industries Renukoot, DCM Shriram Consolidated Ltd Kota, Sandoz Private Ltd, Grasim Industries Ltd and Kaiga Generation Station, Karnataka. Three individual prizes were presented to Richard L. Sandor, chairman and CEO of Chicago Climate Exchange, V. Thulasidas, chairman and MD of Air India and Pritish Nandy, chairman of Pritish Nandy Communications. Earlier, a panel of experts gave their presentations on the issue to combat climatic change. Dr Michael Walsh, former vice-president of Research Chicago Climate Exchange emphasised on the increasing energy efficiency and use of renewable resources. Paul Simpson, chief operating officer, Carbon Disclosure Project, UK, said Du Point, Yes Bank and other corporates had expressed their commitment for adopting energy efficient ways. Animal husbandry and urban development minister Harsh Mahajan announced this here yesterday after dedicating chowgan number-II and V to the people of Chamba after a facelift undertaken at an estimated cost of Rs 70 lakh. The existing Government Postgraduate College would be shifted to Sultanpur, where a new building was proposed to be constructed. After the shifting of the college, the ancient Durbar Hall building would be preserved as a national monument. Mahajan said the government had decided not to install water meters in Chamba and the residents would pay their water bills as per the flat rates fixed by the IPH Department. The students were asked to consult the members of their community and find samples of useful plants. They have received more than 1.25 lakh e-mails, 40,000 letters and thousands of telephone messages. Dr N.K. Kalia, father of Captain Surab Kalia, whose body was handed over to the Indian Army by the Pakistan Army on June 9 in 1999, today said despite the lukewarm attitude of the Government of India and the Indian Defence Ministry in raising the issue in the International Forum against Pakistan and the Pakistani army, he was encouraged by the overall support of the Indian masses in this regard. He said if India and the Defence Ministry would not take up the issue internationally, he would raise this inhuman act of Pakistani Army before the International Court of Justice and the UN Human Rights Commission in order to bring the culprits to book. Captain Surab Kalia who had not received even his first salary, while in service was the first Army officer to communicate about the intrusion of Pakistan army into Kargil Sector of Indian territory. He fought along with five other Army jawans, till their ammunition was exhausted and were captured by the Pakistani army on May 15, 1999. Kalia said for 22 days they kept his son and the five jawans in captivity. When his body was handed over to the Indian Army, his eyes were pierced with hot iron rods, his body was burnt with cigarette butts, his bones were broken and his organs were cut into pieces. He said his repeated requests to the Government of India to take up the issue had been ignored so far. Addressing a press conference at Baddi today, Gurdial Singh Choudhary, SHO, Baddi police station, said Shiv Kumar Yadav who hailed from Azamgarh in UP had confessed to murdering Salim. He was arrested from Jharmajri near Barotiwala yesterday. He was well acquainted with Salim’s family. The accused said he killed the young boy as his father had thrashed him in the past. To avenge this he decided to kill the boy . He said he reached Salim’s house in a drunk state and found Salim’s room open. He entered inside and strangulated Salim. After that he found an iron rod lying in the courtyard. He later stabbed Salim in his chest. Representatives and travel agents of Tourism Malaysia and Dubai Tourism are providing detailed information about the two countries, destinations, major attractions, festivals and special offers and packages to local people and tourists. With Malaysia celebrating “Visit Malaysia Year”, a lot of effort is being put in to offer attractive packages to woo more and more tourists to the country. 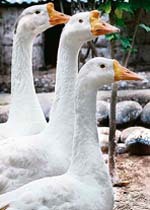 It is for the first time that Dubai Tourism is participating in the event. A spokesperson of India Travel Mart said over 40 persons benefited from the special package being offered on the first day itself. With a lucky draw, the winners of which will win holiday packages, there has been a large turnout at the exhibition. A leopard cub was spotted by residents of Sayaral village near Sundernagar this morning, it was not in a position to walk and it subsequently died. It was just a few days old. A team of Forest officals took the dead cub in their possession and disposed it as per the provisions of the Wild Life Protection Act. 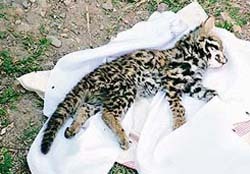 Kanta Guleria of Sayaral village situated on the outskirts of the Sundernagar town spotted the leopard cub at 6.30 am today in her kitchen garden, it was unable to walk, so the local residents in order to save its life put it into a basket and kept it safely and informed the forest officials but it died. As the news spread in the area, the local residents, mostly children, gathered on the spot to see the cub. A team of forest officials reached on the spot and took the dead cub in their possession and recorded the statements of local residents and further informed the police as per the provisions of the Wild Life Protection Act. On the request of the police the postmortem examination of the cub was conducted at Veterinary Hospital, here. As per the postmortem report the cub had died of starvation. Though the decision of state government revoking its previous order to install water meters in Chamba was announced publicly by animal husbandry and urban development minister Harsh Mahajan earlier this week, the IPH department had been continuing to enforce that order. Intriguingly, these orders are without any reference number and date. According to the previous orders of the state government, it was obligatory for the consumers to install water meters at their own expenses and ensure maintenance.